Ross serves the requirements of the Food, Cosmetic and Pharmaceutical industries, in virtually every industrialized country around the world. 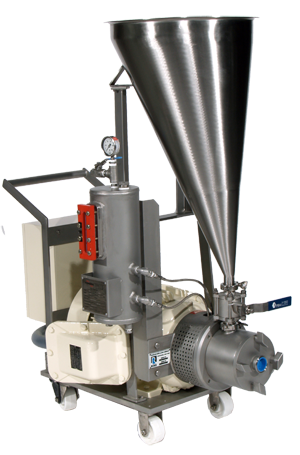 We have the experience and production capacity that no other manufacturer of specialty mixing and blending equipment can match. In the USA alone, we operate five plants, an analytical laboratory and a vigorous R&D program. Overseas, Ross sanitary equipment is being built in our own factories in China and India, and manufactured under license in other countries. Typical applications include mixing, blending, particle size reduction, emulsification, homogenization, powder induction, vacuum processing and more. Specifications that define a mixer built for a sanitary application reflect a combination of industry standards, and the mixing functions needed for that particular application. A sub-micron emulsion, for example, requires high-shear agitation, vacuum and usually a heat-transfer system. The size of the mixer is determined by the throughput required. To guard against batch-to-batch contamination, CIP and SIP capabilities are usually designed in, along with such devices as air-purged seals and custom designed discharge valves. To ensure a high degree of repeatability, and to document the production of every batch, we often add a control system with data-logging capability. Laboratory testing and in-plant trial rentals are offered to insure the selection of the best Ross mixer for your specific production requirements. Click Here to determine what Sanitary Mixer will work best for your application.